The publishers and companies listed here offer commercial foreign language curricula to homeschoolers. You will find everything from supplemental materials to complete curriculum packages. Some of these companies provide printed materials, while others make materials available online through paid memberships. For additional resources, be sure to check out our compilation of websites offering free printable foreign language materials and interactive activities and games. Biblical Greek and Classical Latin for children. 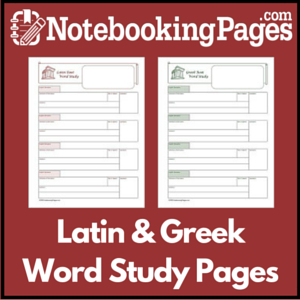 You will also find free educational pages that can help students learn the Greek alphabet and Greek and Latin words. Learn and Master Sign Language is a comprehensive course to learn all about the art of this beautiful and expressive language. In each lesson, you will learn vocabulary, practice signing and reception skills with sentences, questions, dialogues, and narratives. There are over 2000 vocabulary words. You will also learn about expansion features in ASL, finger spelling, numbers, and facts about Deaf culture. Memoria Press publishes Christian-based Latin, Greek, and French foreign language curricula. They offer Latin for students in grades K-12, a Greek alphabet book for grades 2 and up, and French for students in grades 6-8. Click here and save 20% when you purchase Memoria Press products through our affiliate Nest Learning, or visit www.memoriapress.com to learn more. Created by the BBC, the acclaimed MUZZY language learning courses target your child's “window of opportunity” years to learn a second or even a third language. The lovable MUZZY and his delightful friends will guide your child on the journey to learning a new language. This program is oftentimes available at your local library, so if you would like to try it before you buy it check there first! Rocket Languages offers online language courses in Arabic, Chinese (Mandarin), German, Hindi, Italian, Japanese, Korean, Portuguese, Russian and American Sign Language; as well as English courses for speakers of Spanish and Japanese. Features include native pronunciation, voice recognition, progress tracking, and vocabulary lists, to name a few. You can try their courses for free and, when you're ready to buy, save $50 off of any Rocket Languages foreign language course with coupon code ROCKETDEAL. Rosetta Stone Homeschool is rated the #1 language learning software by homeschooling parents. Help your children learn a second (or third!) language quickly and effectively with Rosetta Stone Homeschool. A complete Latin curriculum for homeschoolers. Recommended for grades 5-12. The Latin Road curriculum is designed in a multisensory style of teaching. It is a balanced combination of oral and written work. Students will hear, say, see, read, and write the language constantly. In this way, all students can learn with their strengths and yet get to practice their weaknesses. With The Learnables®, foreign languages can be learned easily and without the need of a tutor. No teacher guides or manuals are required. Special tests and answer keys are provided in order to enable the parents to grade the progress of their children. The beginning material is organized into year/levels. Each year/level is equivalent to one year of high school. However, children can complete a year's level as an elementary or junior high school student. Transparent Language Online bridges the gap between learning a language and using that language in the real world by allowing users to do both – completely online and all in one program. Transparent Language Online features scientifically-proven methodology, the widest variety of high-quality learning material, and seamless integration of real-life language use by native speakers.